Tigers 2018 Draft Pick Chavez Fernander Special, I like this pick. Drafted by the Detroit Tigers in the 35th round of the MLB June 2018 draft out of Polk State College, the 2018 number 1135th overall pick became the third player from the Bahamas to be drafted out of Polk State College. Besides Chavez, the other two players were Albert Cartwright Jr 2007 the Mets and Shameko Smith 2017 the Rookies. Chavez enrolled at Faith Baptist Christian Academy in 2014, joining up with some childhood friends from Grand Bahama. Namely Chavez Young and Shameko Smith, Where they all graduate together in 2016, Fernander and Smith went on to Polk State College. Whiles Young drafted. Both pitchers started their college careers with the talent to excel In the meantime. However, at the end of their freshman year, both players were hoping for the call at the 2017 MLB Draft. Eventually, only Shameko Smith got the called by the Rookies whiles Chavez went back to College for his sophomore year. 2018 season and another solid performance by Chavez Fernander. Chavez appeared in 17 games, nine games started, with eight wins, four losses, and no saves. Also, 58.1 innings pitched, 3.09 earn run average and 63 strikeouts. A college career of 104 strikeouts in 83.1 innings. 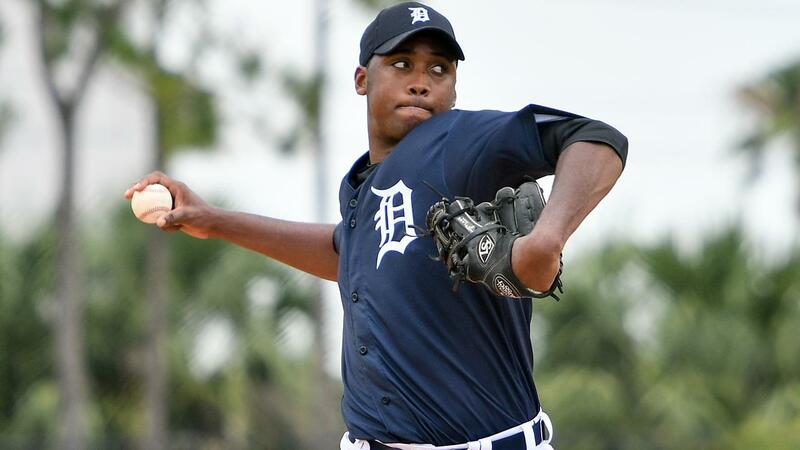 The numbers were good enough for the Detroit Tigers who drafted Chavez Fernanader in 35 round of the 2018 draft. Chavez pitched in four games with GCL Tigers East before moving to GCL Tigers West, where he continued his steady pitching. Having a .075 ERA, in twelve innings and fifteen strikeouts, before moving. Fernander made an impact with the Tigers West that saw him start in five of ten games he played. Pitching in 26.2 innings with a 3-1 win/loss record, 24 strikeouts with a 1.69 ERA for the West Tigers. Eventually, The Tigers West went on to win the GCL Championship where Chavez Fernander was the winning pitcher. Pitching 5.1innings pitched, four hits one earned run two walks nine strikeouts for the win. Game Story Link. 2018 season stats 4-1 wins/lost, 39.2 innings, eight runs, seven earned, 41 strikeouts and 1.59 ERA. His season ended, with a promotion to short-season Connecticut Tigers of the New York Penn League. Tigers 2018 Draft Pick Chavez Fernander Special. Chavez Fernander is standing at 6′ 3″ and 203lbs with plenty of room for improvement on the mound; He will be Special. Mr. Fernander is now in the instructional league and is looking forward to returning home to host a pitching clinic. As a Detriot Tigers fan, I say Chavez Fernander is Special for the Tigers. He will also be at 2019 Don’t Blink 242 Home Run Derby in Paradise, hosted by Todd Isaacs Jr and Lucius Fox Jr.
By the way, we hope to see you all in Nassau, the Bahamas for the 2019 Home Run Derby in Paradise. ← Previous Story Indians Todd Isaacs Jr Don’t Blink!! !